The Criterion Collection returns to a movie it first released back in 1998, Samuel Fuller’s sensationalist crime drama The Naked Kiss, and re-issues it with the quality, class and adornments we’ve come to expect from the blue ribbon supplier. Constance Towers isn't sure if she likes what she sees in The Naked Kiss (1964). Writer/director Fuller’s tawdry tale (deliciously, pulpishly tawdry!) 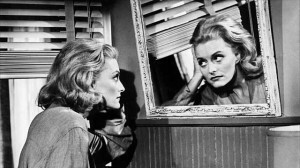 of a former prostitute (Constance Towers, Shock Corridor) who embarks on a new life in a respectable suburban town only to discover that there are a slew of perverse secrets simmering beneath its seemingly wholesome surface, remains a bizarre, melodramatic shocker and one of the filmmaker’s finest films. Foreseeing Lynch’s Blue Velvet, the movies of Todd Solondz (Happiness, Welcome to the Dollhouse) and many others, Fuller’s Naked Kiss (and Towers’ bald-headed heroine) still delivers the sweetest pucker. Criterion’s first swipe at the movie in 1998 featured an acceptable print of the film and not much else in the way special features. Not so, this time around. This new Naked Kiss Blu-ray is outfitted with a handful of vintage interviews with Fuller, including one particularly lively one from a 1967 episode of the French TV series Cinéastes de Notre Temps. Also fine is the new half-hour interview with Towers conducted by film historian Charles Dennis, wherein the well-spoken actor offers her memories of shooting the film and how Fuller always knew when he was satisfied with a scene and ready to move on. The video quality of the film is simply outstanding. All the depths and contrasts in Stanley’s Cortez’s (Night of the Hunter) brilliant cinematography is gloriously capture here — it’s quite a noticeable improvement over the previous version and one that Fuller fans are sure to embrace. The audio presentation features an uncompressed monaural soundtrack., which sounds crisp and uninhibited.